* The Montana State Society was organized in 1894, five years after Montana achieved statehood. * The National Board appointed Mary Wasson the State Regent on May 9, 1894. Mrs. Jennie Tallant of Butte was to serve as organizing regent for a chapter in Butte. * The first state-wide project of the MSSDAR was the preservation and restoration of one of the oldest buildings in Montana, a block house at old Fort Benton. * The first Montana State Conference was held in Butte on December 17, 1904, at the home of the State Regent, Mrs. Tallant. * At the 16th State Conference, a scholarship program was established in Montana which continues today. * It was the 21st State Conference before the State Society entertained a President General. * Mrs. Bessie Andrews Rasmusson, State Regent 1927-1928, purchased the first pin to “travel” with each State Regent and then on to the incoming Regent. The emblem that is on the State Regents ribbon was purchased by the state society and Mrs. Iverna Huntsman had the honor to wear the emblem during her first term as State Regent 2002-2004. The State Centennial pin was a gift received in 2007 from Mrs. Iverna Huntsman to be worn on the State Regents ribbon. The Benefactor pin was purchased by Mrs. Peggy Salitros, during her term as State Regent, 2010-2012. * The State Society has 11 chapters with approximately 550 members. We strive to continue to reach the goals and ideals that the founding Daughters set forth. 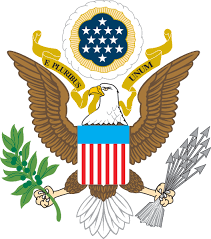 The U.S. Motto is E Pluribus Unum, Latin for "out of many, one" which appears on coins, currency, and many of our buildings and monuments. It refers to forming a cohesive single nation as the 13 colonies joined together, as the sovereign states ratified a more perfect union under the United States Constitution, and as patriots came from around the world to live together as citizens in a spirit of American independence and freedom.